Marya happily takes the gold. She applauds Cyc's performance, and a few other patrons do too. 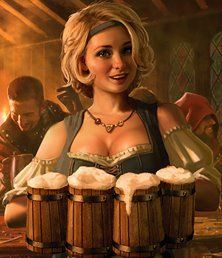 The barmaid goes to the kitchen and a few moments later, she returns to the companions' table, hands full of frothy mugs of ale. She follows up with some rolls and butter. The companions settle back. Their food is being prepared, so they spend time talking, counting the loot, going over their map, whatever. A sketchy looking man wanders close. He reeks of BO. 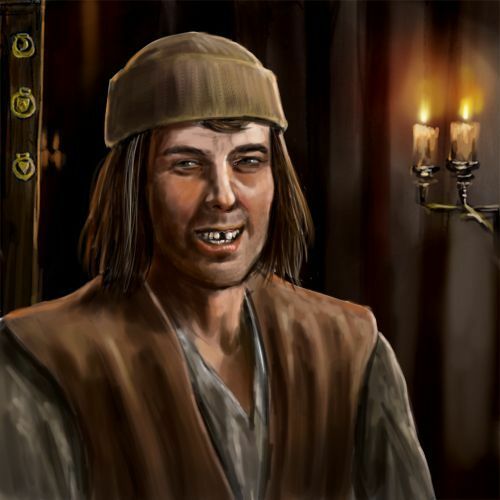 A nervous smile reveals dental issues. "I have a riddle for you fellas, heh. The finger I lick Will soon be red. Nok chuckles, "I do love riddles! The first part sounds me... always hungry. But I dont lick my fingers... much... in public. But I say it sounds like a fire. Fire is always hungry and must be fed wood. If fire "licks" your finger, it will be burned red." The man looks puzzled. "Uh, yeah. That is technically correct. Heh. Let's... try again." The man gives Nok the one-eyed stare, absently fondling something in his vest pocket. "Who makes it, has no need of it. Who buys it, has no use for it. Who uses it can neither see nor feel it. “The answer’s a coffin, friend. Somethin ya may be closer to than ya realize at the moment. How can we be of service to ya? 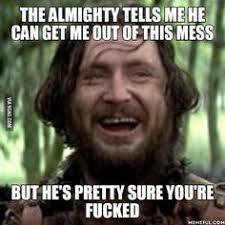 And can it wait until after we’ve had our supper?” Cyc eyes the man suspiciously over the rim of his tankard as he takes a long drink. In Elvish, "the boy has clearly been sent to us with some sort of message. The riddle is part of the pass code to verify our identity, but the proper answer to the riddle is not the answer to the code." The smelly man grins again. "Heh. I had to be sure. It's obvious you fellas ain't with the IC." He pulls out what he'd been holding in his pocket: a whistle. The man runs away to the corner of the room blowing the whistle shrilly. 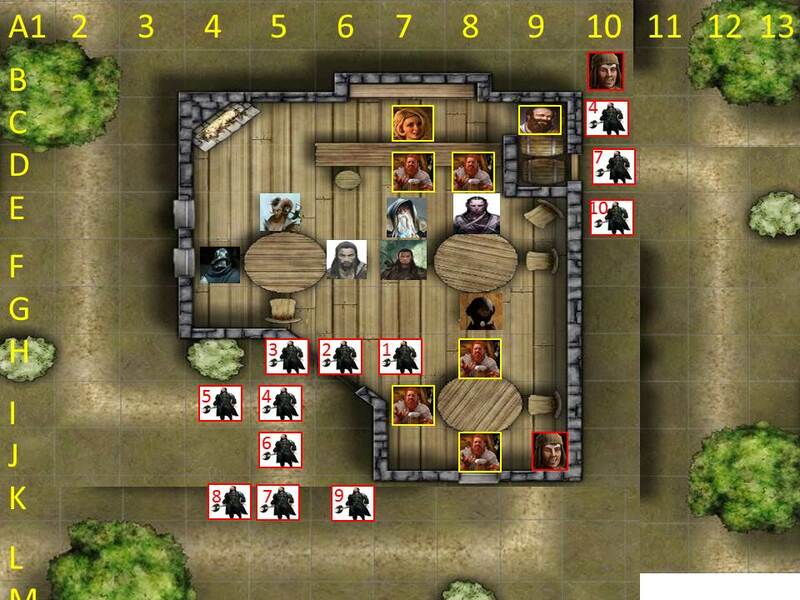 A nanosecond later (having heard "the signal"), a stream of soldiers barge into the tavern. They wear black cloaks with a gray circle device. These brigands appear to be more heavily armed and armored than those the party encountered at Ilyana's. "Now who the hades do you think you are," one of the soldiers snarls when he sees you. "No one in this miserable town's allowed to carry arms! Set 'em down if you know what's good for you!" *Gold-ringed tokens are townies. 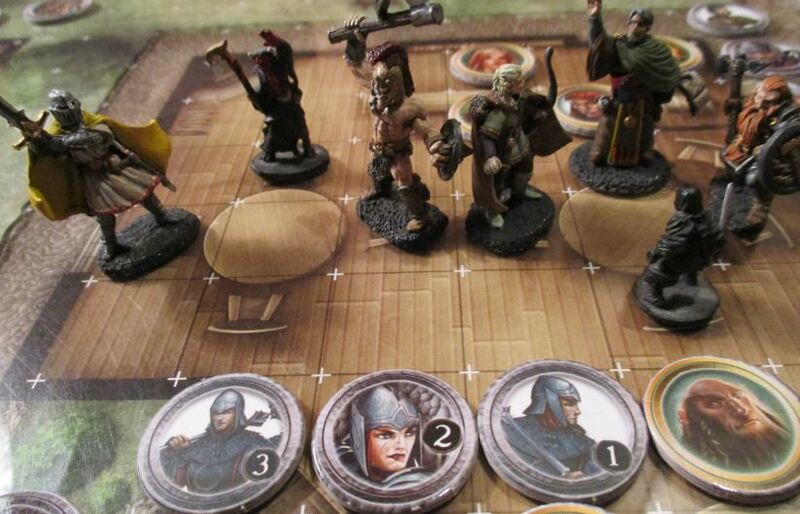 Gray-ringed tokens are foes. Here's the earlier map I posted (for reference). The 3 barrels to the side of the bar is actually a kitchenette. Also, streets run along the south and east sides of the building. "But.... but.... I haven't even had the roast goose with apple sauce yet!" Also, streets run along the south and east sides of the building. 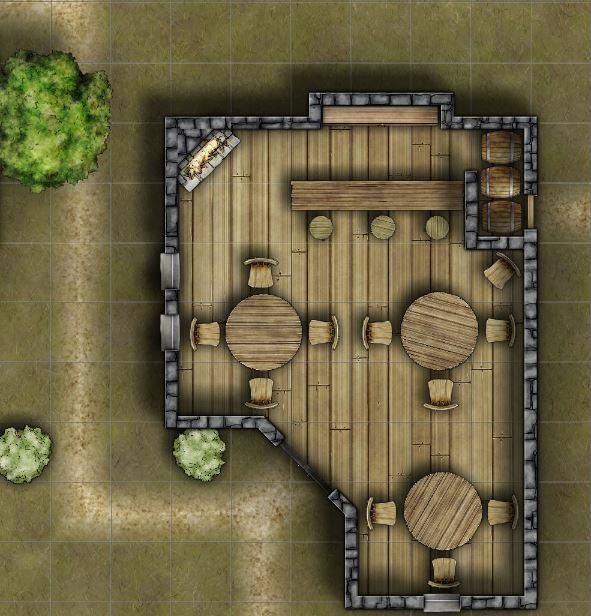 I am working on your digital tavern map. I did a c\p job to add the extra roads and outside space. Sorry the tiles a tad off on the bottom. does this look OK so far? @all - can everyone see the East road and columns 12 and 13? I noticed a discrepancy. Looks like a couple PCs placement is off. It's difficult to tell with a top-down view. 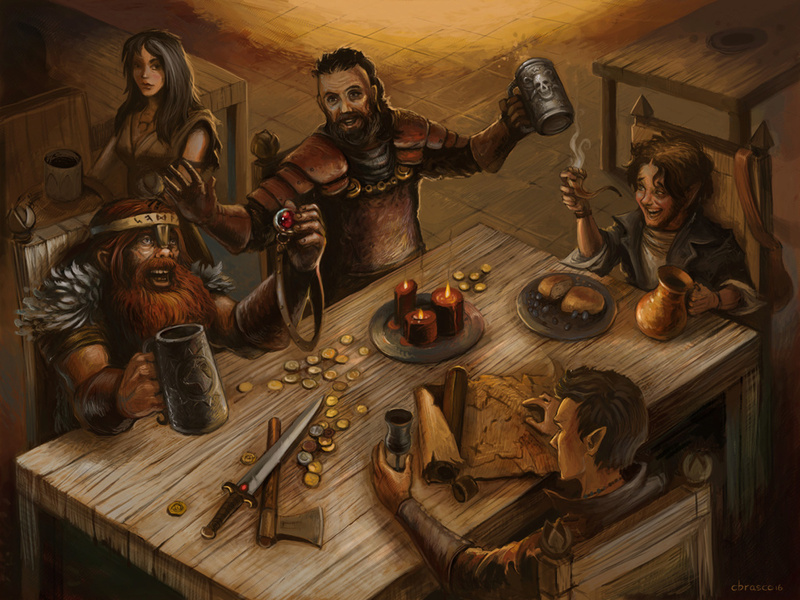 So Drusus, Quxx, and Bru and the west table; and Ara, Leirthal, Cyc, and Nok at the east table. 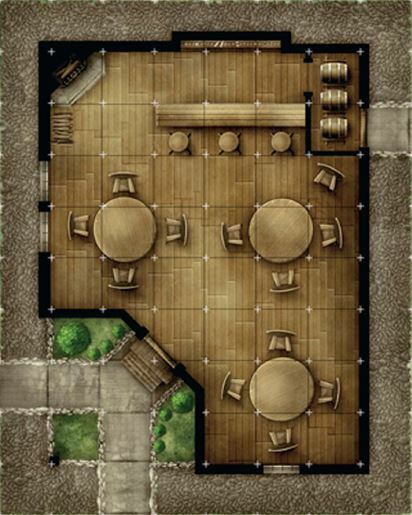 If it helps at all, here's the "official" tavern map (the one I posted is fan-made, but I actually like it better). This map shows the steps to the front door and the stone walkway around the outside of the building. PCs can't see what's happening outside the walls of the tavern (naturally). There's a double window on the west side, next to Drusus (your guys don't notice anyone outside of it) and another window on the south side of the building, behind a townie (also don't see anyone outside it, from what you can see across the room, etc). Robyo wrote: I noticed a discrepancy. Looks like a couple PCs placement is off. It's difficult to tell with a top-down view. I'll wait until Monday to post the initiative roster.. You guys don't necessarily have to fight. You could try to talk, or try to flee. On your turn. DM: just to be clear, Bru gained 10 max HP during level up. he adds those 10, but is still missing the 8 that were missing before, yes? Josef909 wrote: DM: just to be clear, Bru gained 10 max HP during level up. he adds those 10, but is still missing the 8 that were missing before, yes? Correct. If your PC was damaged previous to level-up, you continue to be damaged until taking a long rest, or spend HD on a short rest, or popping a PoH or incur some other kind of magical or skill-based healing during combat.. 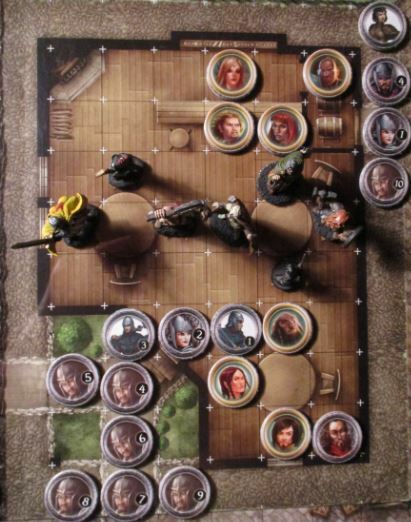 The brigands at the front door are Squad A and act on Initiative-6. *The map view has expanded out since it was first posted, so I might as well include the other tokens in the revealed region. The PCs are unaware of Squad B at the back door. Each creature in a 10-foot-radius sphere must make a Constitution save. A creature takes 3d8 thunder damage on a failed save or half as much on a success. A creature of inorganic material has disadvantage on the save. "Bruzher! Block that door, lad!" Cyc will move past Leirthal to E-7 to place himself between danger and the townsfolk at the bar. @Rob - I updated the map, copying your numbering, but the 4 and 7 in squad B seem off? I made the north-most guy like the other whistle-blower since he didn't have a # or look like an armored brigand. As soon as that hits he immediately looses another shot at Brigand #2 in the doorway in the hopes of jamming up the entrance. Ara then hustles back and up onto the end of the bar at D6 so he can see as much of the room as possible. "Where did that foul faced little whistle blower go?!" Ara yells. "Anyone have him in their sights?" Leirthal added to initiative roster. DM oversight. Cyc damages a bunch of the brigand intruders. He manages to slay #5. Ara kills #4 with his first arrow. Some more brigands suffer under the hail of thorns. The ranger's second arrow kills #2. An unknown force moves behind the scene at initiative-17. Nok is still mad at the whistle-blower for spoiling his roast goose supper. Just checking in w map maker that Ara should be standing on top of bar at D6. Thanks! 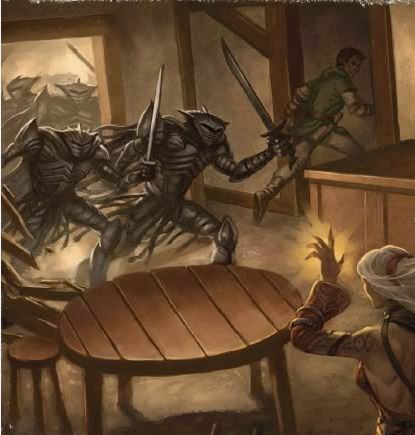 Does #3 have cover against Leirthal in the doorway? Dead bodies as difficult terrain, sure. They are piling up! 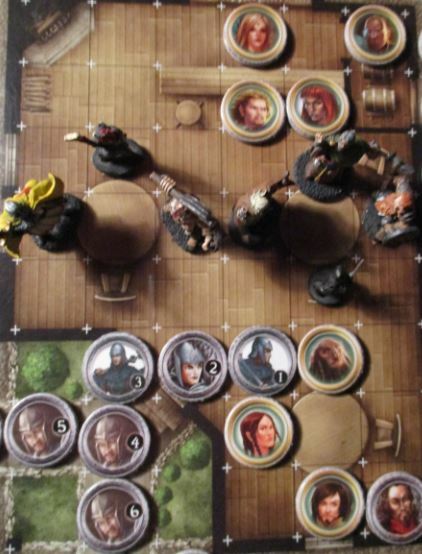 Nok's attack on the riddler is a hit, however, I'm not seeing how he gets Sneak Attack? There isn't another enemy within 5' of target. Need an Athetics check for Ara to jump onto the bar. 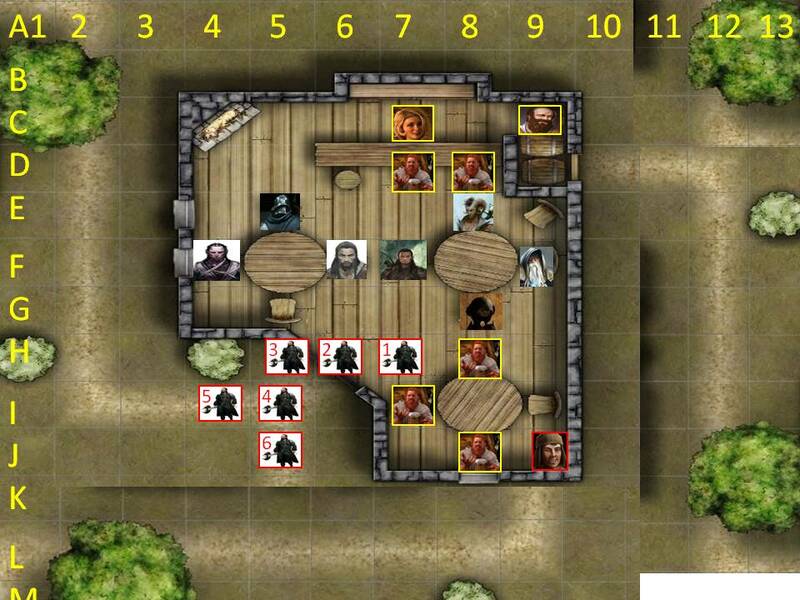 Leirthal can target #3 who is barging through the doorway. I was just ignoring the townsfolk sorry. I took that to mean no other enemies (creatures) as I wouldn't consider a townie that is out of combat a "creature". Wasn’t trying to torpedo your extra dice, sorry. Joe and I have had a couple of intense rules battles over my assassin’s mechanics, which requires a pretty specific set of circumstances in order to max his damage. I’m interested to see how Rob rules on this. Ara deftly hops onto the bar. My townie resents Nok (and Cyc) trying to exclude him from the creature catalog.